With the improving survival of patients with cystic fibrosis (CF), the clinical spectrum of this complex multisystem disease continues to evolve. One of the most important clinical events for patients with CF in the course of this disease is an acute pulmonary exacerbation. Clinical and microbial epidemiology studies of CF pulmonary exacerbations continue to provide important insight into the course, prognosis and complications of the disease. This review provides a summary of the pathophysiology, clinical epidemiology and microbial epidemiology of a CF pulmonary exacerbation. Despite calls for a consensus diagnosis of pulmonary exacerbations by a CF Outcomes Group in 1994 and in a more recent editorial,28,29 no consensus diagnostic criteria exist. Clinical diagnostic criteria commonly used can be found in the Cystic Fibrosis Foundation clinical practice guidelines.30 Definitions have been used in major clinical trials evaluating new treatments in CF. 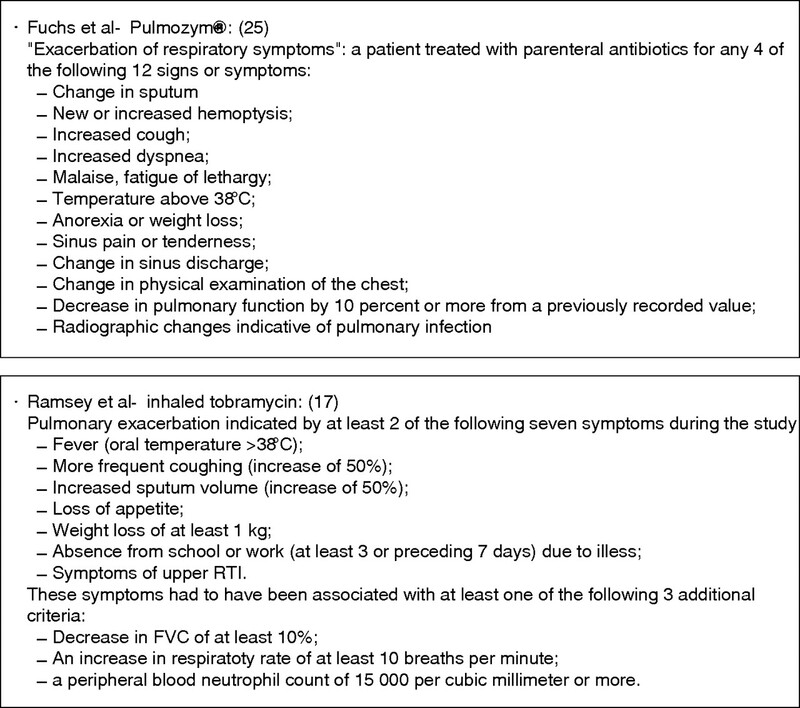 These definitions have been based on empirical data, but have not been formally validated (fig 1).17,25,27 They have combined patient symptomotology, laboratory data and clinician evaluation.17,25 These definitions of a pulmonary exacerbation have revolved around the clinician’s decision to treat a constellation of symptoms, but a treatment decision-defined outcome is, by its nature, problematic. Within the US, practice patterns are far from uniform with regard to the treatment decision for a pulmonary exacerbation,31 so using a treatment decision in the definition is a problem. Two additional scoring systems were developed to diagnose pulmonary exacerbations and were used in two recent phase 2 CF clinical trials. The first score used was the Acute Respiratory Illness Checklist (ARIC).11,12 It was used as a symptom score to identify patients with lower respiratory tract infections, with the goal of capturing a wider spectrum of CF exacerbations in study participants. The second diagnostic score was the Respiratory and Systemic Symptoms Questionnaire (RSSQ; M W Konstan, personal communication); this score was created to have a uniform approach to identifying CF-related pulmonary exacerbations including mild events not necessitating intravenous antibiotics. Table 1 compares the signs and symptoms assessed in these four different instruments to diagnose a CF pulmonary exacerbation. Despite this work, no consensus has been reached regarding the diagnostic criteria for a pulmonary exacerbation. Components of these definitions have been examined to see which clinical characteristics best predict a pulmonary exacerbation.32–34 Rosenfeld and colleagues, using data from a clinical trial, used a multivariate modelling approach to create an algorithm to identify participants with a pulmonary exacerbation.33 Symptoms rather than physical examination and laboratory values were found to be more predictive of a pulmonary exacerbation. Two additional studies have noted very similar results.32,34 The signs and symptoms that were most predictive of a pulmonary exacerbation in all of these studies were increased cough, change in sputum (volume or consistency), decreased appetite or decreased weight, change in respiratory examination and respiratory rate.1 This work points to the clear need to focus on signs and symptoms in any future consensus diagnostic criteria. Mild CF pulmonary exacerbations have received very little attention and no clear definition exists in the literature. There is a spectrum of clinical presentations of exacerbations from clinical events managed as an outpatient to those requiring admission to an intensive care unit (ICU). One could hypothesise that the mild CF pulmonary exacerbation might present as an early precursor of a severe exacerbation, a milder version of a severe exacerbation or an isolated clinical event that does not evolve into a clear lower respiratory tract infection. Detailed natural history data may elucidate which of these patterns predominates and clarify whether particular clinical characteristics predict the outcome of mild events. Evidence in the literature regarding chronic obstructive lung disease suggests that early aggressive treatment of pulmonary exacerbations in that disease improve the longer term clinical outcome;35 this could also be the case in CF. Recent observational data suggest that patients in US CF care centres in the highest quartile of lung function had more courses of intravenous antibiotics than those in the lowest quartile of lung function, suggesting a link between aggressive care and outcome.31 To explore fully this treatment approach in CF, it is necessary to be able to identify mild or early CF pulmonary exacerbations. CF pulmonary exacerbation rates increase with age and more severe pulmonary impairment. Annual rates of CF pulmonary exacerbations by age and by FEV1 in the US CF Patient Registry are shown in figs 2, 3A and 3B. The pulmonary exacerbation rate was defined as a CF-related pulmonary condition requiring admission to hospital or use of home intravenous antibiotics. 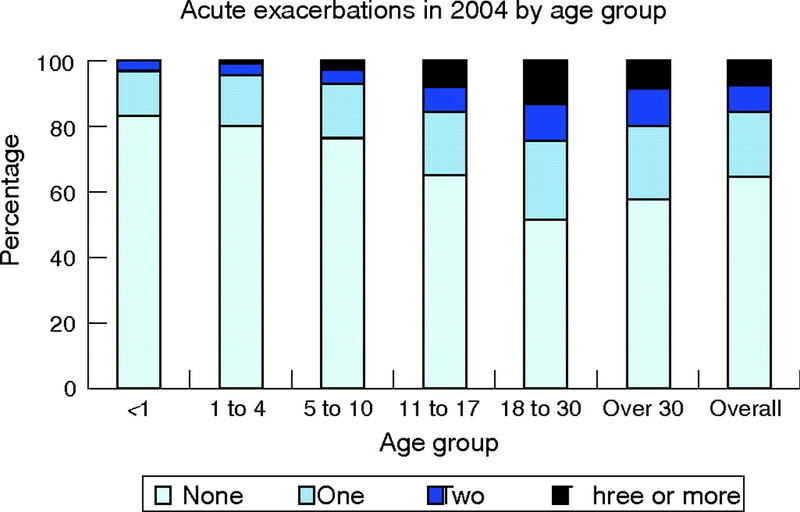 The percentage of patients with CF experiencing one or more pulmonary exacerbations per year rises when subjects become teenagers and young adults (fig 2). Additional data from the Epidemiologic Study of Cystic Fibrosis noted an increasing annual rate at which patients with CF required intravenous antibiotics for pulmonary exacerbations with increasing age (increasing from 23% in subjects under age 6 years to 63% in those over the age of 18).34 Data from the US CF Patient Registry (fig 3A and B) delineate the relationship between lung function and pulmonary exacerbation rate. For adults the relationship is linear, with increasing exacerbation rates with decreasing lung function, while in children the relationship is non-linear (more consistent with an exponential fall in the exacerbation rate with higher FEV1). In both cases, better lung function, as measured by FEV1 percentage predicted, is associated with fewer pulmonary exacerbations. Graph showing the proportion of patients with CF by age group in the US CF Registry population who experienced no exacerbations, one exacerbation, two exacerbations or three or more exacerbations during the year 2004. Data from Cystic Fibrosis Foundation Patient Registry, 2004 Annual Data Report to the Center Directors.83 © Cystic Fibrosis Foundation, 2005. 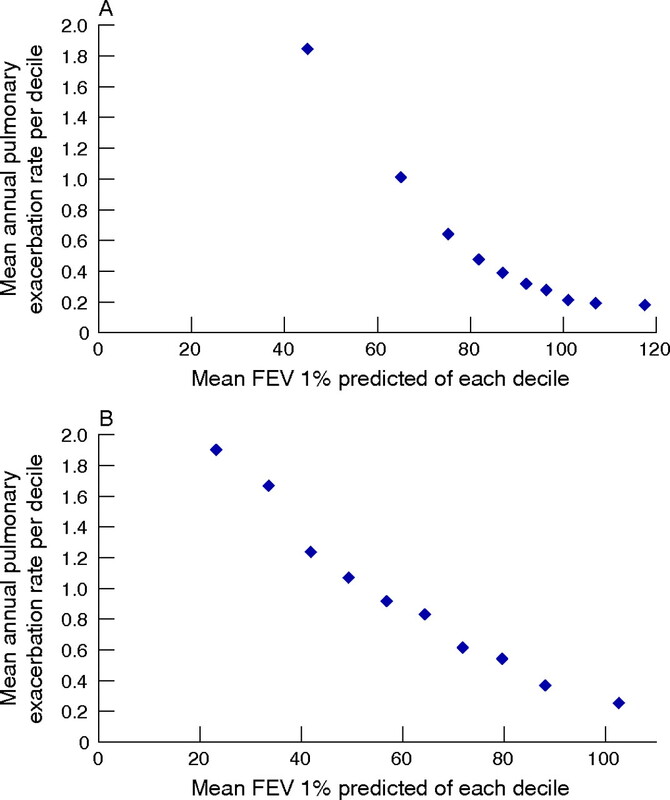 Mean annual rate of pulmonary exacerbation per decile of forced expiratory volume in 1 s (FEV1) percentage of predicted (each decile represents 10% of the total population) in (A) patients with CF <18 years of age and (B) patients ⩾18 years of age. The data represent the mean FEV1 percentage of predicted for 2004 in the US CF Registry in each decile of the population. The annual rate of CF pulmonary exacerbations has clearly been associated with 2 year and 5 year survival in two separate prediction models evaluating the odds of death during follow-up.42–45 CF pulmonary exacerbations requiring intravenous antibiotics have also been associated with later diminished lung function in children aged 1 to 6 years,46 with CF-related diabetes,47 with sleep disturbances and with health-related quality of life.48,49 It is an important marker of disease severity and, as such, has been used as an adjustment variable in studies of survival50–52 and an important outcome measure when assessing the impact of socioeconomic status and environmental exposure on CF.53,54 The pulmonary exacerbation rate has also been used as an important variable to assess new outcome measures such as high resolution computed tomography of the chest or cough frequency.55,56 It will also be essential for assessing future outcome measures. The pulmonary exacerbation rate is clearly in the causal pathway of pulmonary decline in CF, thus linking an outcome to this rate strengthens its validity. Chronic bacterial airway infections are characteristically seen in the majority of individuals with CF. These infections are commonly polymicrobial and rarely can be eradicated with antimicrobial treatment. “Polymicrobial” is defined as an individual patient at a particular point of time infected with a number of different organisms. Knowledge of the natural history of colonisation (culture positivity in the airway) and infection (culture positivity with an associated specific host serological response) can be helpful in the management of CF pulmonary exacerbations. However, the epidemiology can only be established with adequate diagnostic microbiology testing. Culture of respiratory tract specimens from individuals with CF can present challenges to microbiology laboratories unaccustomed to processing them because of problems related to sample viscosity, the polymicrobial nature of infections and slow bacterial growth. In addition, many of the available commercial systems for organism identification and antimicrobial susceptibility testing are inaccurate for CF pathogens.57–60 CF secretions are frequently very viscous, requiring special processing to sample the entire specimen adequately.61 This is probably due to a combination of the primary defect in CFTR, which results in dehydrated airway mucus, and the purulence resulting from airway inflammation. For this reason, CF samples may be treated with dithiothreitol, DNase, or another solubilising agent to decrease viscosity. Sampling of lower airway secretions is considered essential for determining the infectious aetiology of pulmonary exacerbations in CF. This is most readily accomplished using expectorated sputum. However, some individuals with CF are unable to expectorate. This is most common in young children. Bronchoalveolar lavage is an excellent way of sampling the lower airway in non-expectorating CF individuals, but this is too invasive for routine culturing. Chronic CF airway infections are commonly caused by one or more of a characteristic set of bacterial pathogens that appear to be acquired in an age-dependent sequence (fig 4). Of the most frequently identified bacterial organisms causing airway infections in CF, only S aureus is generally considered to be pathogenic in individuals who are not immunocompromised. P aeruginosa, B cepacia complex, non-typeable H influenzae, Stenotrophomonas maltophilia, and Achromobacter xylosoxidans are often considered opportunistic pathogens. All of these organisms can variably be associated with pulmonary exacerbations in CF. Other chronically infecting organisms seen in CF that are also generally non-pathogenic in the healthy host include Aspergillus and non-tuberculous mycobacteria. These organisms are usually not associated with exacerbations in patients with CF. 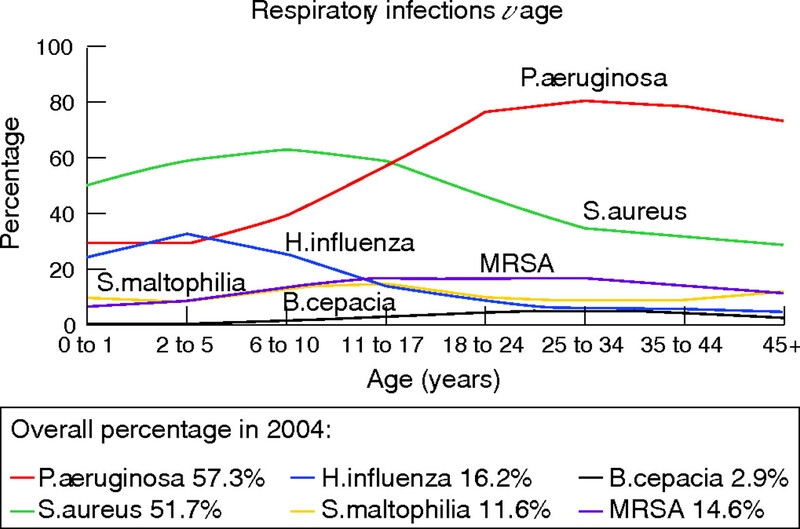 Prevalence of selected respiratory pathogens in respiratory cultures of CF patients by age. Data from Cystic Fibrosis Foundation Patient Registry, 2004 Annual Data Report to the Center Directors.83 © Cystic Fibrosis Foundation, 2005. Non-typeable H influenzae is also isolated from the respiratory tract early in the course of CF. In natural history studies of prospectively followed infants with CF, including those identified by neonatal screening, H influenzae was the most common organism isolated from lower airway cultures in the first year of life.69,81 Although H influenzae is associated with exacerbations in patients with non-CF bronchiectasis,82 its role in progressive airway infection and inflammation in patients with CF is unclear. Several studies have demonstrated multiple genotypes of P aeruginosa present in a single sputum sample. Thus, Aaron and colleagues (as noted above) investigated how commonly acquisition of a new genotype of P aeruginosa was associated with a CF exacerbation.18 Among 80 individuals followed for 2 years with quarterly sputum cultures, 40 patients experienced a pulmonary exacerbation. Only 36 had isolates that could be genotyped and, of those, only two subjects demonstrated acquisition during exacerbation of a new clone that had not been present during a period of clinical stability. Early infections with P aeruginosa are commonly susceptible to anti-pseudomonal β-lactam antibiotics (including ticarcillin, piperacillin, ceftazidime, cefoperazone, and the carbopenems), the aminoglycosides and the fluoroquinolones. However, as patients age, antibiotic resistance appears more frequently. At Danish CF centres a significant increase in resistance to β-lactams was seen over two decades, but no correlation was found between the increase in minimal inhibitory concentration and the number of courses of anti-pseudomonal treatment.105 Multiple antibiotic resistance, defined as in vitro susceptibility to only a single class of antimicrobial agents, has been reported in up to 11.6% of P aeruginosa isolates from individuals with CF in the USA.64 Data from Italian CF centres found that 17.4% of P aeruginosa isolates were multiply resistant.106 These multiply resistant isolates present an important management problem to clinicians. In order to help identify active antibiotic treatment for patients with multiresistant isolates, non-standard methods of susceptibility including synergy testing and multiple combination bactericidal testing (MCBT) have been developed to test two and three drug combinations.107,108 These methods are being used by CF clinicians to guide treatment. However, a recent prospective study examining the clinical efficacy of MCBT for directing antibiotic treatment in 132 CF subjects with pulmonary exacerbations did not result in improved clinical or microbiological outcomes.109 Interestingly, even standard susceptibility testing has not been clearly shown to improve patient outcome.110 More recently, evidence of biofilm formation by organisms in the CF airway has prompted the investigation of biofilm susceptibility testing.111,112 Different drugs and drug combinations appear to be efficacious against P aeruginosa growing in biofilms; this may help to explain non-bactericidal mechanisms of activity of antimicrobial treatment. While clinical laboratories have not been routinely looking for methicillin resistance in S aureus isolated from patients with CF, a survey of isolates from a number of CF centres in the USA suggested that the rate of resistance in CF is comparable to that in the general population.64 Recent data from the US CF Foundation found that 14.6% of S aureus was methicillin resistant.83 Vancomycin tolerance and resistance have both been described in human isolates of S aureus,113 and it is likely that they will also be seen in individuals with CF as they become more common. B cepacia complex organisms are often highly antibiotic resistant. All are intrinsically resistant to the aminoglycosides114 and the rate of in vitro resistance to the β-lactam antibiotics, with the exception of meropenem, is also quite high.115,116 The quinolones have variable activity, but resistance can be readily induced.115 In vitro susceptibility testing suggests that there are combinations of antibiotics that act synergistically against B cepacia complex using either synergy testing or MBCT.116,117 Synergy testing, using two drug combinations, found that no active combination could be identified for 57% of isolates tested.117 The most active combinations were chloramphenicol plus minocycline (49% of isolates) and chloramphenicol plus ceftazidime (26% of isolates). MBCT testing using two or three drug combinations determined that at least one combination could be identified for all isolates tested.108 The majority of active combinations included meropenem. Unfortunately, it was not possible to predict for a given isolate whether a drug combination would be synergistic, additive or antagonistic. Other antibiotic resistant Gram-negative CF isolates include S maltophilia and A xylosoxidans. Treatment of these organisms is often complicated by resistance to the aminoglycosides and variable susceptibility to the β-lactams and quinolones. The most active single drugs in vitro against S maltophilia are ticarcillin/clavulanate and trimethoprim/sulfamethoxazole; the most active combination in synergy studies is ticarcillin/clavulanate plus aztreonam.118 In a study of 106 CF isolates of A xylosoxidans, the most active drugs were imipenem (59% susceptible), piperacillin/tazobactam (55%), meropenem (51%) and minocycline (51%).119 The most active additive or synergistic combinations were chloramphenicol plus minocycline, ciprofloxacin plus imipenem, and ciprofloxacin plus meropenem. Research regarding pulmonary exacerbations in cystic fibrosis continues to evolve, generating new hypotheses regarding the pathophysiology of CF and improving our understanding of the natural history of the disease in patients with CF. Pulmonary exacerbations continue to have a significant impact on the lives of children and adults with CF. Improving our understanding of these events will have implications for basic research and clinical research in CF. Although much has been learned about pulmonary exacerbations in CF, the most problematic areas of research continue to be our limited understanding of the basic pathophysiology of these events and the need for clear consensus diagnostic criteria. Ferkol T, Rosenfeld M, Milla CE. Cystic fibrosis pulmonary exacerbations. J Pediatr2006;148:259–64. Boucher RC. New concepts of the pathogenesis of cystic fibrosis lung disease. Eur Respir J2004;23:146–58. Randell SH, Boucher RC. Effective mucus clearance is essential for respiratory health. Am J Respir Cell Mol Biol2006;35:20–8. Mall M, Grubb BR, Harkema JR, et al. Increased airway epithelial Na+ absorption produces cystic fibrosis-like lung disease in mice. Nat Med2004;10:487–93. Donaldson SH, Bennett WD, Zeman KL, et al. Mucus clearance and lung function in cystic fibrosis with hypertonic saline. N Engl J Med2006;354:241–50. Elkins MR, Robinson M, Rose BR, et al. A controlled trial of long-term inhaled hypertonic saline in patients with cystic fibrosis. N Engl J Med2006;354:229–40. Joo NS, Irokawa T, Wu JV, et al. Absent secretion to vasoactive intestinal peptide in cystic fibrosis airway glands. J Biol Chem2002;277:50710–5. Joo NS, Lee DJ, Winges KM, et al. Regulation of antiprotease and antimicrobial protein secretion by airway submucosal gland serous cells. J Biol Chem2004;279:38854–60. Joo NS, Irokawa T, Robbins RC, et al. Hyposecretion, not hyperabsorption, is the basic defect of cystic fibrosis airway glands. J Biol Chem2006;281:7392–8. Hiatt PW, Grace SC, Kozinetz CA, et al. Effects of viral lower respiratory tract infection on lung function in infants with cystic fibrosis. Pediatrics1999;103:619–26. Piedra PA, Grace S, Jewell A, et al. Purified fusion protein vaccine protects against lower respiratory tract illness during respiratory syncytial virus season in children with cystic fibrosis. Pediatr Infect Dis J1996;15:23–31. Piedra PA, Cron SG, Jewell A, et al. Immunogenicity of a new purified fusion protein vaccine to respiratory syncytial virus: a multi-center trial in children with cystic fibrosis. Vaccine2003;21:2448–60. Regelmann WE, Elliott GR, Warwick WJ, et al. Reduction of sputum Pseudomonas aeruginosa density by antibiotics improves lung function in cystic fibrosis more than do bronchodilators and chest physiotherapy alone. Am Rev Respir Dis1990;141:914–21. Smith AL, Redding G, Doershuk C, et al. Sputum changes associated with therapy for endobronchial exacerbation in cystic fibrosis. J Pediatr1988;112:547–54. Wat D, Doull I. Respiratory virus infections in cystic fibrosis. Paediatr Respir Rev2003;4:172–7. van Ewijk BE, van der Zalm MM, Wolfs TF, et al. Viral respiratory infections in cystic fibrosis. J Cyst Fibros2005;4 (Suppl 2) :31–6. Ramsey BW, Pepe MS, Quan JM, et al. Intermittent administration of inhaled tobramycin in patients with cystic fibrosis. Cystic Fibrosis Inhaled Tobramycin Study Group. N Engl J Med1999;340:23–30. Aaron SD, Ramotar K, Ferris W, et al. Adult cystic fibrosis exacerbations and new strains of Pseudomonas aeruginosa. Am J Respir Crit Care Med2004;169:811–5. Konstan MW, Walenga RW, Hilliard KA, et al. Leukotriene B4 markedly elevated in the epithelial lining fluid of patients with cystic fibrosis. Am Rev Respir Dis1993;148:896–901. Konstan MW, Hilliard KA, Norvell TM, et al. Bronchoalveolar lavage findings in cystic fibrosis patients with stable, clinically mild lung disease suggest ongoing infection and inflammation. Am J Respir Crit Care Med1994;150:448–54. Bonfield TL, Panuska JR, Konstan MW, et al. Inflammatory cytokines in cystic fibrosis lungs. Am J Respir Crit Care Med1995;152:2111–8. Sagel SD, Kapsner R, Osberg I, et al. Airway inflammation in children with cystic fibrosis and healthy children assessed by sputum induction. Am J Respir Crit Care Med2001;164:1425–31. Ordonez CL, Henig NR, Mayer-Hamblett N, et al. Inflammatory and microbiologic markers in induced sputum after intravenous antibiotics in cystic fibrosis. Am J Respir Crit Care Med2003;168:1471–5. Colombo C, Costantini D, Rocchi A, et al. Cytokine levels in sputum of cystic fibrosis patients before and after antibiotic therapy. Pediatr Pulmonol2005;40:15–21. Saiman L, Marshall BC, Mayer-Hamblett N, et al. Azithromycin in patients with cystic fibrosis chronically infected with Pseudomonas aeruginosa: a randomized controlled trial. JAMA2003;290:1749–56. Ramsey BW, Boat T F. Outcome measures for clinical trials in cystic fibrosis. Summary of a Cystic Fibrosis Foundation consensus conference. J Pediatr1994;124:177–92. Marshall BC. Pulmonary exacerbations in cystic fibrosis: it’s time to be explicit! Am J Respir Crit Care Med2004;169:781–2. Cystic Fibrosis Foundation. Microbiology and infectious disease in cystic fibrosis: V (Section 1). Bethesda, MD: Cystic Fibrosis Foundation, 1994. Johnson C, Butler SM, Konstan MW, et al. Factors influencing outcomes in cystic fibrosis: a center-based analysis. Chest2003;123:20–7. Dakin C, Henry RL, Field P, et al. Defining an exacerbation of pulmonary disease in cystic fibrosis. Pediatr Pulmonol2001;31:436–42. Rosenfeld M, Emerson J, Williams-Warren J, et al. Defining a pulmonary exacerbation in cystic fibrosis. J Pediatr2001;139:359–65. Rabin HR, Butler SM, Wohl ME, et al. Pulmonary exacerbations in cystic fibrosis. Pediatr Pulmonol2004;37:400–6. Wilkinson TM, Donaldson GC, Hurst JR, et al. Early therapy improves outcomes of exacerbations of chronic obstructive pulmonary disease. Am J Respir Crit Care Med2004;169:1298–303. Ellaffi M, Vinsonneau C, Coste J, et al. One-year outcome after severe pulmonary exacerbation in adults with cystic fibrosis. Am J Respir Crit Care Med2005;171:158–64. Texereau J, Jamal D, Choukroun G, et al. Determinants of mortality for adults with cystic fibrosis admitted in Intensive Care Unit: a multicenter study. Respir Res2006;7:14. Dobbin CJ, Milross MA, Piper AJ, et al. Sequential use of oxygen and bi-level ventilation for respiratory failure in cystic fibrosis. J Cyst Fibros2004;3:237–42. Sood N, Paradowski LJ, Yankaskas JR. Outcomes of intensive care unit care in adults with cystic fibrosis. Am J Respir Crit Care Med2001;163:335–8. Vedam H, Moriarty C, Torzillo PJ, et al. Improved outcomes of patients with cystic fibrosis admitted to the intensive care unit. J Cyst Fibros2004;3:8–14. Slieker MG, van Gestel JP, Heijerman HG, et al. Outcome of assisted ventilation for acute respiratory failure in cystic fibrosis. Intensive Care Med2006;32:754–8. Liou TG, Adler FR, Fitzsimmons SC, et al. Predictive 5-year survivorship model of cystic fibrosis. Am J Epidemiol2001;153:345–52. Liou TG, Adler FR, Cahill BC, et al. Survival effect of lung transplantation among patients with cystic fibrosis. JAMA2001;286:2683–9. Mayer-Hamblett N, Rosenfeld M, Emerson J, et al. Developing cystic fibrosis lung transplant referral criteria using predictors of 2-year mortality. Am J Respir Crit Care Med2002;166:1550–5. Liou TG, Adler FR, Huang D. Use of lung transplantation survival models to refine patient selection in cystic fibrosis. Am J Respir Crit Care Med2005;171:1053–9. Emerson J, Rosenfeld M, McNamara S, et al. Pseudomonas aeruginosa and other predictors of mortality and morbidity in young children with cystic fibrosis. Pediatr Pulmonol2002;34:91–100. Marshall BC, Butler SM, Stoddard M, et al. Epidemiology of cystic fibrosis-related diabetes. J Pediatr2005;146:681–7. Britto MT, Kotagal UR, Hornung RW, et al. Impact of recent pulmonary exacerbations on quality of life in patients with cystic fibrosis. Chest2002;121:64–72. Dobbin CJ, Bartlett D, Melehan K, et al. The effect of infective exacerbations on sleep and neurobehavioral function in cystic fibrosis. Am J Respir Crit Care Med2005;172:99–104. Goss CH, Otto K, Aitken ML, et al. Detecting Stenotrophomonas maltophilia does not reduce survival of patients with cystic fibrosis. Am J Respir Crit Care Med2002;166:356–61. Goss CH, Rubenfeld GD, Otto K, et al. The effect of pregnancy on survival in women with cystic fibrosis. Chest2003;124:1460–8. Goss CH, Mayer-Hamblett N, Aitken ML, et al. Association between Stenotrophomonas maltophilia and lung function in cystic fibrosis. Thorax2004;59:955–9. Schechter MS, Shelton BJ, Margolis PA, et al. The association of socioeconomic status with outcomes in cystic fibrosis patients in the United States. Am J Respir Crit Care Med2001;163:1331–7. Goss CH, Newsom SA, Schildcrout JS, et al. Effect of ambient air pollution on pulmonary exacerbations and lung function in cystic fibrosis. Am J Respir Crit Care Med2004;169:816–21. Brody AS, Sucharew H, Campbell JD, et al. Computed tomography correlates with pulmonary exacerbations in children with cystic fibrosis. Am J Respir Crit Care Med2005;172:1128–32. Smith JA, Owen EC, Jones AM, et al. Objective measurement of cough during pulmonary exacerbations in adults with cystic fibrosis. Thorax2006;61:425–9. Kiska DL, Kerr A, Jones MC, et al. Accuracy of four commercial systems for identification of Burkholderia cepacia and other gram-negative nonfermenting bacilli recovered from patients with cystic fibrosis. J Clin Microbiol1996;34:886–91. Shelly DB, Spilker T, Gracely EJ, et al. Utility of commercial systems for identification of Burkholderia cepacia complex from cystic fibrosis sputum culture. J Clin Microbiol2000;38:3112–5. Saiman L, Burns JL, Larone D, et al. Evaluation of MicroScan Autoscan for identification of Pseudomonas aeruginosa isolates from cystic fibrosis patients. J Clin Microbiol2003;41:492–4. Burns JL, Saiman L, Whittier S, et al. Comparison of two commercial systems (Vitek and MicroScan-WalkAway) for antimicrobial susceptibility testing of Pseudomonas aeruginosa isolates from cystic fibrosis patients. Diagn Microbiol Infect Dis2001;39:257–60. Wong K, Roberts MC, Owens L, et al. Selective media for the quantitation of bacteria in cystic fibrosis sputum. J Med Microbiol1984;17:113–9. Carson LA, Tablan OC, Cusick LB, et al. Comparative evaluation of selective media for isolation of Pseudomonas cepacia from cystic fibrosis patients and environmental sources. J Clin Microbiol1988;26:2096–100. Henry DA, Campbell ME, LiPuma JJ, et al. Identification of Burkholderia cepacia isolates from patients with cystic fibrosis and use of a simple new selective medium. J Clin Microbiol1997;35:614–9. Burns JL, Emerson J, Stapp JR, et al. Microbiology of sputum from patients at cystic fibrosis centers in the United States. Clin Infect Dis1998;27:158–63. Whitby PW, Carter KB, Burns JL, et al. Identification and detection of Stenotrophomonas maltophilia by rRNA- directed PCR. J Clin Microbiol2000;38:4305–9. Liu L, Coenye T, Burns JL, et al. Ribosomal DNA-directed PCR for identification of Achromobacter (Alcaligenes) xylosoxidans recovered from sputum samples from cystic fibrosis patients. J Clin Microbiol2002;40:1210–3. Coenye T, Vandamme P, LiPuma JJ. Infection by Ralstonia species in cystic fibrosis patients: identification of R pickettii and R mannitolilytica by polymerase chain reaction. Emerg Infect Dis2002;8:692–6. Qin X, Emerson J, Stapp J, et al. Use of real-time PCR with multiple targets to identify Pseudomonas aeruginosa and other nonfermenting gram-negative bacilli from patients with cystic fibrosis. J Clin Microbiol2003;41:4312–7. Armstrong DS, Grimwood K, Carlin JB, et al. Bronchoalveolar lavage or oropharyngeal cultures to identify lower respiratory pathogens in infants with cystic fibrosis. Pediatr Pulmonol1996;21:267–75. Rosenfeld M, Emerson J, Accurso F, et al. Diagnostic accuracy of oropharyngeal cultures in infants and young children with cystic fibrosis. Pediatr Pulmonol1999;28:321–8. Kabra SK, Alok A, Kapil A, et al. Can throat swab after physiotherapy replace sputum for identification of microbial pathogens in children with cystic fibrosis? Indian J Pediatr2004;71:21–3. De BK, Alifier M, Vandeputte S. Sputum induction in young cystic fibrosis patients. Eur Respir J2000;16:91–4. Henig NR, Tonelli MR, Pier MV, et al. Sputum induction as a research tool for sampling the airways of subjects with cystic fibrosis. Thorax2001;56:306–11. Suri R, Marshall LJ, Wallis C, et al. Safety and use of sputum induction in children with cystic fibrosis. Pediatr Pulmonol2003;35:309–13. Ho SA, Ball R, Morrison LJ, et al. Clinical value of obtaining sputum and cough swab samples following inhaled hypertonic saline in children with cystic fibrosis. Pediatr Pulmonol2004;38:82–7. Armstrong DS, Grimwood K, Carlin JB, et al. Lower airway inflammation in infants and young children with cystic fibrosis. Am J Respir Crit Care Med1997;156:1197–204. Lyczak JB, Cannon CL, Pier GB. Lung infections associated with cystic fibrosis. Clin Microbiol Rev2002;15:194–222. Fitzsimmons SC. The changing epidemiology of cystic fibrosis. J Pediatr1993;122:1–9. Ratjen F, Comes G, Paul K, et al. Effect of continuous antistaphylococcal therapy on the rate of P aeruginosa acquisition in patients with cystic fibrosis. Pediatr Pulmonol2001;31:13–6. Stutman HR, Lieberman JM, Nussbaum E, et al. Antibiotic prophylaxis in infants and young children with cystic fibrosis: a randomized controlled trial. J Pediatr2002;140:299–305. Barker AF. Bronchiectasis. N Engl J Med2002;346:1383–93. Cystic Fibrosis Foundation. Patient Registry 2004 Annual Data Report. 1–2. Bethesda, Maryland :2005. Demko CA, Byard PJ, Davis PB. Gender differences in cystic fibrosis: Pseudomonas aeruginosa infection. J Clin Epidemiol1995;48:1041–9. Li Z, Kosorok MR, Farrell PM, et al. Longitudinal development of mucoid Pseudomonas aeruginosa infection and lung disease progression in children with cystic fibrosis. JAMA2005;293:581–8. Hancock RE, Mutharia LM, Chan L, et al. Pseudomonas aeruginosa isolates from patients with cystic fibrosis: a class of serum-sensitive, nontypable strains deficient in lipopolysaccharide O side chains. Infect Immun1983;42:170–7. Luzar MA, Montie TC. Avirulence and altered physiological properties of cystic fibrosis strains of Pseudomonas aeruginosa. Infect Immun1985;50:572–6. Ernst RK, Yi EC, Guo L, et al. Specific lipopolysaccharide found in cystic fibrosis airway Pseudomonas aeruginosa. Science1999;286:1561–5. Thomas SR, Ray A, Hodson ME, et al. Increased sputum amino acid concentrations and auxotrophy of Pseudomonas aeruginosa in severe cystic fibrosis lung disease. Thorax2000;55:795–7. Drenkard E, Ausubel FM. Pseudomonas biofilm formation and antibiotic resistance are linked to phenotypic variation. Nature2002;416:740–3. Thomassen MJ, Demko CA, Klinger JD, et al. Pseudomonas cepacia colonization among patients with cystic fibrosis. A new opportunist. Am Rev Respir Dis1985;131:791–6. Isles A, Maclusky I, Corey M, et al. Pseudomonas cepacia infection in cystic fibrosis: an emerging problem. J Pediatr1984;104:206–10. LiPuma JJ. Update on the Burkholderia cepacia complex. Curr Opin Pulm Med2005;11:528–33. LiPuma JJ, Spilker T, Gill LH, et al. Disproportionate distribution of Burkholderia cepacia complex species and transmissibility markers in cystic fibrosis. Am J Respir Crit Care Med2001;164:92–6. Biddick R, Spilker T, Martin A, et al. Evidence of transmission of Burkholderia cepacia, Burkholderia multivorans and Burkholderia dolosa among persons with cystic fibrosis. FEMS Microbiol Lett2003;228:57–62. Kidd TJ, Bell SC, Coulter C. Genomovar diversity amongst Burkholderia cepacia complex isolates from an Australian adult cystic fibrosis unit. Eur J Clin Microbiol Infect Dis2003;22:434–7. Cunha MV, Leitao JH, Mahenthiralingam E, et al. Molecular analysis of Burkholderia cepacia complex isolates from a Portuguese cystic fibrosis center: a 7-year study. J Clin Microbiol2003;41:4113–20. Mahenthiralingam E, Vandamme P, Campbell ME, et al. Infection with Burkholderia cepacia complex genomovars in patients with cystic fibrosis: virulent transmissible strains of genomovar III can replace Burkholderia multivorans. Clin Infect Dis2001;33:1469–75. Kalish LA, Waltz DA, Dovey M, et al. Impact of Burkholderia dolosa on lung function and survival in cystic fibrosis. Am J Respir Crit Care Med2006;173:421–5. Tan K, Conway SP, Brownlee KG, et al. Alcaligenes infection in cystic fibrosis. Pediatr Pulmonol2002;34:101–4. Burns JL, Saiman L, Whittier S, et al. Comparison of agar diffusion methodologies for antimicrobial susceptibility testing of Pseudomonas aeruginosa isolates from cystic fibrosis patients. J Clin Microbiol2000;38:1818–22. Ciofu O, Giwercman B, Pedersen SS, et al. Development of antibiotic resistance in Pseudomonas aeruginosa during two decades of antipseudomonal treatment at the Danish CF Center. APMIS1994;102:674–80. Taccetti G, Campana S, Marianelli L. Multiresistant non-fermentative gram-negative bacteria in cystic fibrosis patients: the results of an Italian multicenter study. Italian Group for Cystic Fibrosis microbiology. Eur J Epidemiol1999;15:85–8. Saiman L, Mehar F, Niu WW, et al. Antibiotic susceptibility of multiply resistant Pseudomonas aeruginosa isolated from patients with cystic fibrosis, including candidates for transplantation. Clin Infect Dis1996;23:532–7. Lang BJ, Aaron SD, Ferris W, et al. Multiple combination bactericidal antibiotic testing for patients with cystic fibrosis infected with multiresistant strains of Pseudomonas aeruginosa. Am J Respir Crit Care Med2000;162:2241–5. Aaron SD, Vandemheen KL, Ferris W, et al. Combination antibiotic susceptibility testing to treat exacerbations of cystic fibrosis associated with multiresistant bacteria: a randomised, double-blind, controlled clinical trial. Lancet2005;366:463–71. Smith AL, Fiel SB, Mayer-Hamblett N, et al. Susceptibility testing of Pseudomonas aeruginosa isolates and clinical response to parenteral antibiotic administration: lack of association in cystic fibrosis. Chest2003;123:1495–502. Aaron SD, Ferris W, Ramotar K, et al. Single and combination antibiotic susceptibilities of planktonic, adherent, and biofilm-grown Pseudomonas aeruginosa isolates cultured from sputa of adults with cystic fibrosis. J Clin Microbiol2002;40:4172–9. Moskowitz SM, Foster JM, Emerson J, et al. Clinically feasible biofilm susceptibility assay for isolates of Pseudomonas aeruginosa from patients with cystic fibrosis. J Clin Microbiol2004;42:1915–22. Appelbaum PC. The emergence of vancomycin-intermediate and vancomycin-resistant Staphylococcus aureus. Clin Microbiol Infect2006;12 (Suppl 1) :16–23. Moore RA, Hancock RE. Involvement of outer membrane of Pseudomonas cepacia in aminoglycoside and polymyxin resistance. Antimicrob Agents Chemother1986;30:923–6. Lewin C, Doherty C, Govan J. In vitro activities of meropenem, PD 127391, PD 131628, ceftazidime, chloramphenicol, co-trimoxazole, and ciprofloxacin against Pseudomonas cepacia. Antimicrob Agents Chemother1993;37:123–5. Aaron SD, Ferris W, Henry DA, et al. Multiple combination bactericidal antibiotic testing for patients with cystic fibrosis infected with Burkholderia cepacia. Am J Respir Crit Care Med2000;161:1206–12. Burns JL, Saiman L. Burkholderia cepacia infections in cystic fibrosis. Pediatr Infect Dis J1999;18:155–6. Krueger TS, Clark EA, Nix DE. In vitro susceptibility of Stenotrophomonas maltophilia to various antimicrobial combinations. Diagn Microbiol Infect Dis2001;41:71–8. Saiman L, Chen Y, Tabibi S, et al. Identification and antimicrobial susceptibility of Alcaligenes xylosoxidans isolated from patients with cystic fibrosis. J Clin Microbiol2001;39:3942–5. Support: Leroy Matthew Physician Scientist, Cystic Fibrosis Foundation; NIH (NHBLI) 1 K23 HL72017-01 (CG).